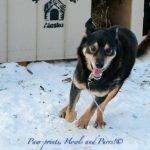 Pixie lives with two seniors who really love her and she gets free run on their rural property. We brought her a doghouse for times that she is outdoors and lots of toys, this girl is so fun and playful. We have continued our relationship with the family and have provided food from our pet food pantry.